GAMBAJ (pronounced GAMB – /AI/) means “boot” in Piedmont dialect, coming from “gambale” or “stivale” in the Italian language. It suggests the geographic form of Italy and at the same time refers to the image of the boot on the label. The name and image are reminiscent of the boots worn by farmers for work in the vineyards. 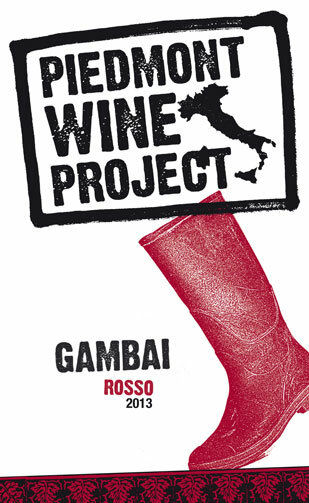 Carefully selected lots of wine from various producers and from diverse areas of Piedmont. Partly aged in stainless steel and partly in wood (around 6 months) depending on the varietal. Blended and bottled around 9 months after the harvest. vibrant ruby red, not too intense but brilliant. Fresh aromas of violets, cherry, blackberry, and raspberry, peach. Aromatic spices like anise and white pepper. In the mouth, medium tannic, not too “hot”, easy drinking. perfectly paired with simple but tasty traditional Piedmont dishes (hot and cold appetizers, egg – pasta dishes) or finger foods and slightly spicy meat and poultry dishes. Best to drink young (within 4-5 years) at about 16°C / 60°F.